Great Britain's Rebecca Adlington swam a time of 8:14.10 to win the Olympic 800 m freestyle race and broke Janet Evans' existing world record, the most enduring performance in the then current swimming records. Rebecca's stroke mechanics were recognized as being exceptional. To satisfy that attribution, the Swimming Science Journal features two sections of the remarkable swim. These analyses give clear indications of how the swimmer uses each arm under a seemingly high degree of fatigue. Each frame in this analysis that features the right arm action is 0.1 seconds apart. The following analysis is somewhat different to the majority of the analyses contained in this "How Champions Do It" section. Rather than discussing individual frames, the general features of the swimmer's technique are discussed, but in no particular order of importance. The emphasis is on the right arm pull because the angle of viewing obscures some of the subtle features of the left arm movement pattern. The swimmer's streamline throughout the whole stroke is excellent. Even when breathing to the right (Frames #8 through #15), the horizontal alignment of all major body parts is maintained. Keeping the head low and turning it on the longitudinal axis is the admirable feature. That contrasts to the normal deviation of the hips and downward pressure of the opposite-to-breathing arm stroke that occurs when the head is lifted to breathe. The hips and shoulders rotate considerably. The hips appear to turn to approximately 45°each side (Frames #5 and #11). The shoulders rotate even more than the hips, facilitating good use of both the internal and external rotator muscle groups to produce the best abduction and adduction of the upper arms in the arm pull. The stroke is long. Contrasting with the misconception of "front-quadrant swimming" that is common in USA swimming, this swimmer has a long stroke that features not only a full reach forward (Frames #3 and #8), but a long push back (Frames #3 and #11). The more length back that can be achieved, the greater will be the release momentum generated. Frame #3 is somewhat similar to, and possibly slightly better than, that displayed by Janet Evans in her analysis in this section of the Swimming Science Journal. Also in Frame #3, the left hand still generates propulsion at the end of the stroke because drag turbulence still comes off the back of the hand. While many coaches have adopted the belief that stroke length is most important (possibly because it is easy to measure), it is the "effective stroke length" that is more important. The effective length is the distance over which propulsion is generated. The greater that distance, the great can be the release momentum. Rebecca Adlington displays perhaps the best effective stroke length of any swimmer included in this journal section. It is a feature that should be used as an ideal example for instructional and explanatory purposes. The early phase of the right arm pull differs to the over-simplified description of "early vertical forearm" used by many coaches when discussing crawl stroke technique. The repositioning of the arm segments to produce an effective pull occurs in a particular segmental sequence and in concert with the development of propulsive forces. In Frame #4, the right wrist bends and the hand is angled to produce pressure on the water (in Frame #5, drag turbulence already is visible). In Frame #5, the elbow bends, the hand and wrist maintain pressure on the water, and abduction of the upper arm begins. In Frame #6, the elbow continues to bend and the amount and speed of abduction increases. It is only in Frame #7 that the forearm and hand are vertical; and that has occurred when abduction is approximately 50% completed. From then on Frames #7 through #9, the upper and lower arm and hand move as a unified propelling surface, presenting the greatest surface area possibly for the development of propulsive forces. This sequencing produces gradual accrual of propulsive forces, which would increase momentum as the arm action progresses. A fixation on an early vertical forearm could disrupt the development of propulsive forces and also interfere with the natural sequencing of arm and shoulder segments for creating the most economical force production. The one feature that does warrant a minor criticism is the position of the head upon returning after breathing. In Frames #1, #2, #3, and #16, a long stream of turbulent flow trails off the face. That turbulence indicates a force that would be resistive. If after breathing, the swimmer returned the face looking directly to the bottom or even backward in a minor way, the existing drag resistance could be reduced. The swimmer performed a six-beat kick for the whole race. That is uncommon for top distance swimmers. For example, Kate Ziegler used a two-beat kick for most of her world record 1500 m race. Many Olympic 800 m champions (e.g., Brooke Bennet, Janet Evans, Laure Manaudou) also used two-beat kicks. 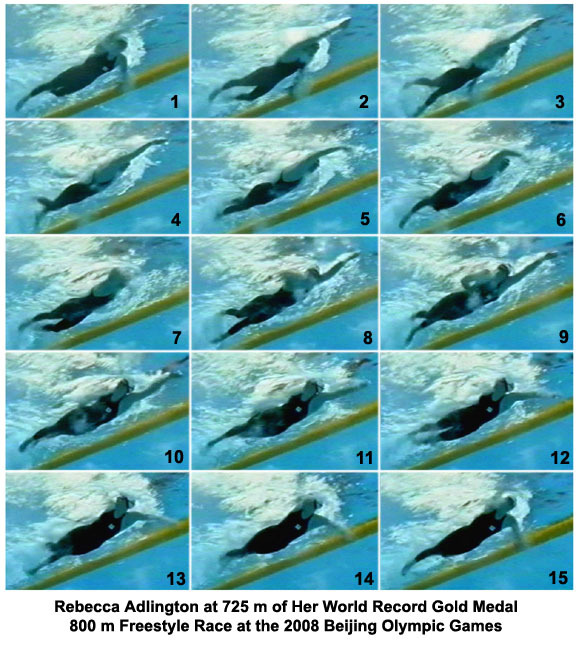 However, with Rebecca Adlington's very long effective stroke, there is time to fit in six small, mostly similar kicks. Not only do they keep her streamlined, but they allow her to perform more effectively with her arms at the stroke movement extremes. There would be no benefit and only pitfalls if this swimmer tried to kick harder during a race. Not only is the kick non-propulsive, it is more fatiguing the harder it is performed, and it takes longer to complete the six-kick cycle (which could cause an unproductive delay in the arm-stroke cycle). It would be unwise for a coach to teach distance swimmers to kick six-beats if their strokes were not long enough to accommodate them and/or there was an emphasis on "getting propulsion" out of the kicks. The above features describe some of the reasons why Rebecca Adlington is the new Queen of distance-swimming.